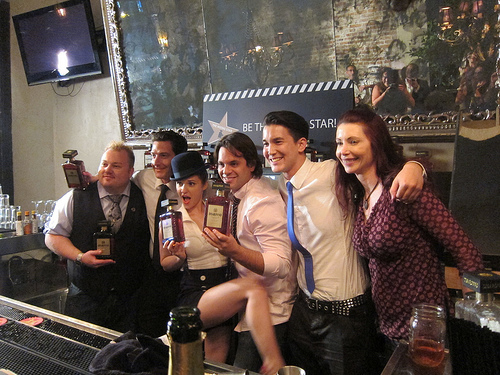 On Monday, May 21st, 18 bartenders gathered at St. Felix in Hollywood for their shot at Disaronno’s Mixing Star competition. Of the 18, 7 will go on to the finals and a total of 17 finalists will compete in Las Vegas in June. The grand prize is a trip to Mumbai, India and a chance at a role in a Bollywood movie. 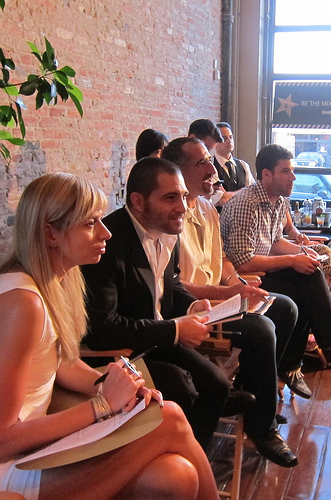 Judges included Disaronno US Marketing Manager Effie Panagopoulos, Disaronno National Ambassador Paul Sevigny, USBG President David Nepove and Adrian Biggs from Pour Vous bar and Bacardi Ambassador. 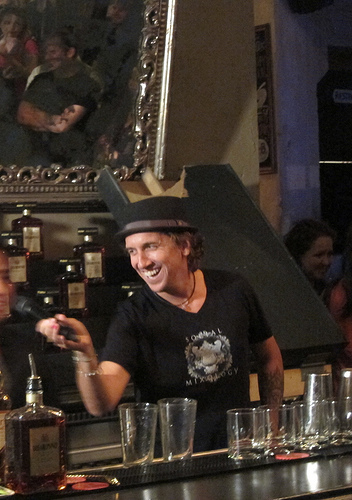 Disaronno West Coast Ambassador and Bar Magic’s Tobin Ellis served as MC for the evening. 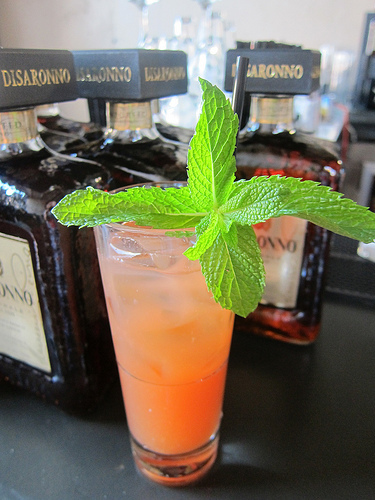 Guests imbibed on Disaronno cocktails such as the Sicilian Smash (Disaronno, Barcadi 8, blood orange, lemon, mint) and the Sorrentine Punch (Disaronno, rum, Campari, grapefruit) while watching the competitors make 3 cocktails in 10 minutes for the judges. First up was Joshua-Peter Smith from Aspen. He would later take 7th place of the regional heat. What was unusual about his cocktail was the use of both heavy cream and goat cheese. 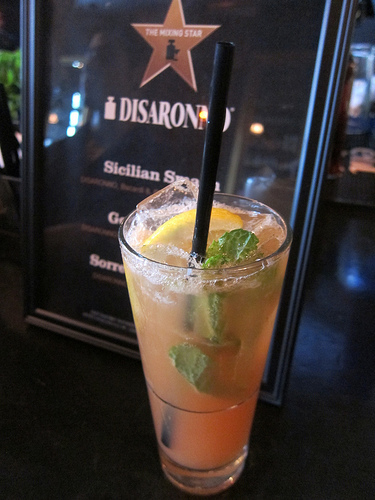 Smith is a former chef and drew on his background for his inspiration for this Disaronno cocktail with apples and goat cheese. Muddle apple. Add rest of ingredients and shake with ice. Double strain into Rocks glass with crushed ice. Orange zest for garnish. 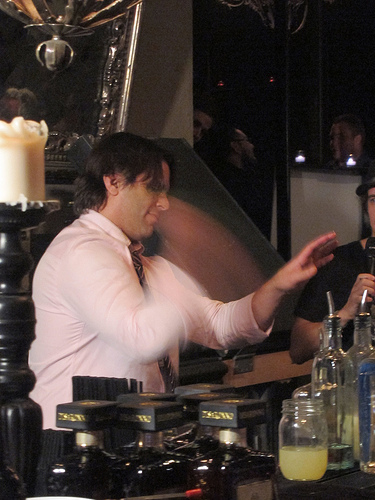 Roger Gross works at the Vesper Bar at the Cosmopolitan Hotel in Las Vegas. He described being frustrated with his former sales job and seeing the light when he saw a bartender having a great time and making a ton of cash. Now he works at one of the best bars in Las Vegas. He calls his cocktail the Chance Encounter. Roger came in 6th. Muddle cardamom. Add rest of ingredients. Dry shake. Then Shake with ice. Strain into cocktail glass. Garnish with 3 cardamom pods. Part of the competition was judged on personality and it counted towards 40% of the score. 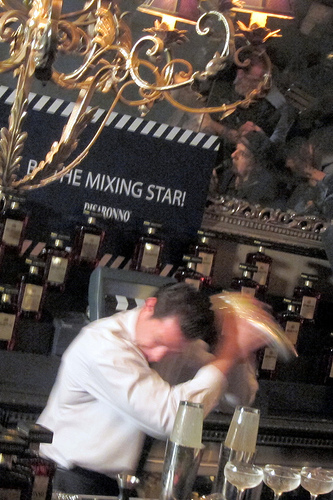 I had seen Jake Bliven compete at the recent Don Q finals at Manhattan Cocktail Classic as did USBG President David Nepove. Mr. Nepove remarked Jake seemed like an entirely different bartender. And it must have been a positive thing as Jake came in 5th. Combine ingredients. Dry shake. Then shake with ice. Strain into cocktail glass. Garnish with mint and grated cocoa. Lauran September from the Spare Room in LA made a dramatic entrance. She was carried out on a chair by two half-dressed men. Watch the video here. Tobin Ellis had been drawing the personalities out of the more quiet bartenders– asking if they spoke other languages or inquiring about their favorite curse word. As you can imagine, Lauran hardly needed the Q&A to show off her personality after that grand entrance but when she answered the curse word question, the room grew quiet. 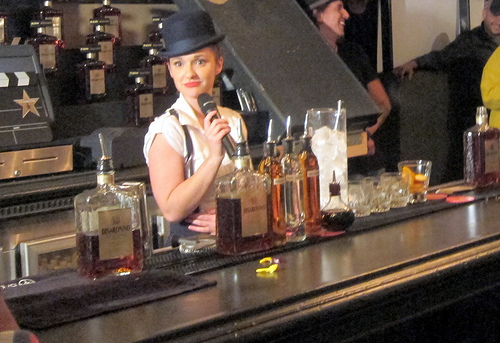 And probably quite a few bartenders murmured her favorite word when they realized they could have disarmed the crowd with a circus trick of their own. Lauran landed in 4th place. Stir ingredients in large mixing glass. Strain into rocks glass with large ice. Orange peel for garnish. Armando Conway from La Descarga in LA luckily followed Lauran and quickly asked a buddy to carry him in. They were blowing their whistles (quite a few LA bartenders wear these whistles that honors a charity that gives them to Africans to ward off attacks) to the music and the hoots and hollers of the crowd. When asked if he spoke other languages, Armando promptly said he did- 5 which included Cuban, Colombian, Mexican, etc. There was much laughter from the crowd and he came in 3rd. Combine all ingredients. Shake and strain into old fashioned glass with ice. Grapefruit peel and mint for garnish. 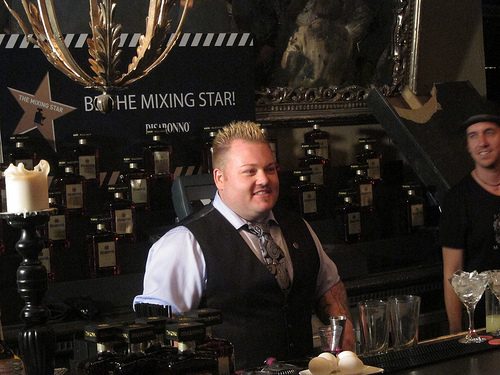 Quinn Johnson is a relative newcomer to the bartending competition scene. He started out working at a college bar and now works at Planet Dailies/ Mixology 101 helmed by Joe Brooke for the Maestro, Salvatore Calabrese. Watching Quinn was like watching Salvatore himself. He had the same sort of showy movements when shaking a tin that had been designed by Maestro Calabrese. Although I was fearful of a drink that contained both Disaronno and another strong Italian liqueur, it turns out the Italians love each other. 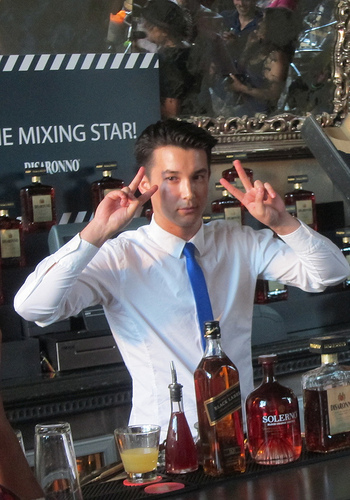 Quinn’s drink won the judges’ hearts and he was awarded 2nd place. Combine all ingredients. Shake and strain into old fashioned glass with ice. Garnish with orange peel and clove. 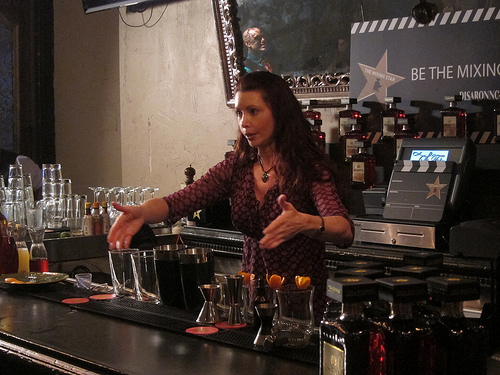 Patricia Richards from Las Vegas came out behind the bar to personally chat with the judges and then she blessed them by sprinkling marigold petals on them. She described her drink, My Chai, as something she thought of when she thought about possibly winning that trip to Mumbai, India. I remember having a version of her winning cocktail from the Repeal Day party Social Mixology threw last December in Vegas. With two different Indian whiskeys as well as the Disaronno, this cocktail may lead her to Bollywood. Combine all ingredients. 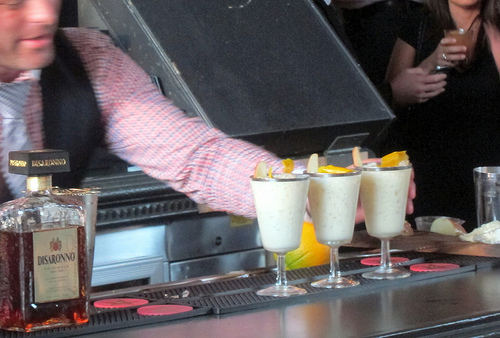 Shake and strain into old fashioned glass with crushed ice. Garnish with kumquat and clove garnish. After nearly 5 hours, the winners were announced and now the anticipation is high for the finals in Las Vegas. 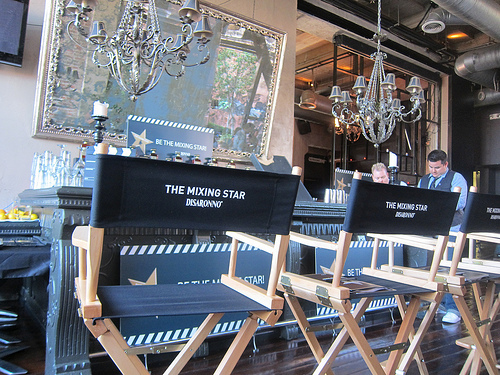 Who will be the next Mixing Star? And will they have to dance in the Bollywood movie? This entry was posted in alcohol education, alcohol tasting, bar stories, bars, bartenders, cocktail competition, cocktails, contest, events, hot bartenders, la, la cocktails, los angeles, spirits, the minty and tagged adrian biggs, amaretto, armando conway, bollywood, cahuenga, cocktail competition, cocktail recipes, competition, david nepove, disaronno, disaronno amaretto, disaronno mixing star, effie panagopoulos, hollywood, jake blivan, joshua-peter smith, la regional, las vegas, lauran september, mixing star, patricia richards, paul sevigny, quinn johnson, roger gross, st. felix, the minty, tobin ellis. Bookmark the permalink.